Copper is a (POS) computer software which provides a business with a cash register system. This cash register software can be used to store product information and speed up the checkout process for your customers. The solution helps streamlining the retail checkout process for your employees and customers by allowing to easily record sales transactions and print receipts for customers. Businesses can efficiently manage product pricing and discounts. 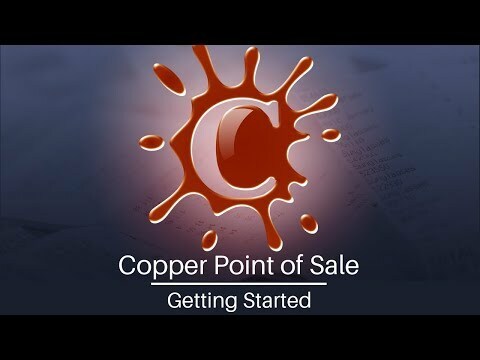 Copper Point-of-Sale Software makes it easy to get started with a POS system. The download takes just seconds and we offer a free trial to see if it is the right program for you. This brief video takes you through the process of creating a business, adding salespeople and starting your first transaction. This point-of-sale software is for both windows and mac users. Q. Can I set up Copper to be accessed from a Local Area Network? Yes, Copper can be set up to be accessed from a local area network or from the internet. Click the Options button on the toolbar.> Go to the Sync Apps - Network Tab.> Select the checkbox for Allow access to Copper on the local network or Allow access to Copper from the internet.> Click OK to save your changes. Q. Can I sync data between Copper and Inventoria? Yes, using Inventoria as the server program, you can update Inventoria's inventory levels from Copper. Q. Which external devices does Copper support? At this time Copper supports USB barcode scanners, receipt printers and usb credit card readers. Many cash drawers are controlled by the receipt printer. Choose a receipt printer that works with Copper and a cash drawer that is compatible with it and works in this manner. Q. Does Copper support multiple SalesPeople? Yes, Copper does support multiple Salespeople, limited only by the size of your hard drive. This is ideal for a small store that does not require multiple cash registers. Q. Can I use custom-sized paper for receipts? Copper allows you to print a variety of different receipt sizes. Do the following to select a receipt size: Click the Options button on the toolbar.> Go to the Receipt tab.> Select the checkbox next to Print small size receipts.> Use the drop-down list next to Paper Width: to select your preferred receipt size.